Background: Coumarin derivatives as dihydrocoumarins have been reported to have multiple biological activities, such as antioxidant and anti-inflammatory properties. Apocynin (APO), which is a substituted-methoxy-catechol, is the most commonly used inhibitor of the multienzymatic complex NADPH-oxidase. Objective: To increase the potency of APO as an NADPH oxidase inhibitor and its antioxidant and anti-inflammatory activities, we synthesized a compound by combining the structural features of a dihydrocoumarin and APO. Method: The dihydrocoumarin-apocynin derivative (HCA) was synthesized and evaluated in antioxidant and cell-based bioassays and compared with APO. 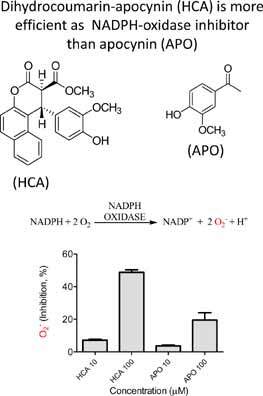 Results: We found that HCA (IC50 = 10 µ M) acted as an inhibitor of NADPH oxidase (ex vivo assays) and was more potent than APO (EC50 > 10 µM). The inhibitory effect on NADPH oxidase was not related to simple radical scavenger activity. HCA was also a more effective radical scavenger than APO, as verified in the DPPH (EC50 = 50.3 versus EC50 > 100 µ M), triene degradation (slope AUC/concentration 759 ± 100 versus 101 ± 15) and FRAP (slope 0.159 versus 0.015) assays. The tested compound demonstrated a similar activity as an inhibitor of the oxidative damage provoked by peroxyl radicals in erythrocyte membranes. Conclusion: HCA showed superior capacity as inhibitor of NADPH oxidase and antioxidant activity. These findings show that HCA could be an improved substitute for APO and deserves further in vivo anti-inflammatory studies. NADPH oxidase, apocynin, coumarin, neutrophils, antioxidant. Department of Chemistry, Faculty of Sciences, São Paulo State University (UNESP), P. O. Box 473, 17033-36, Bauru, São Paulo, Brazil.